The keyword function in Firefox is a real timesaver. When I type NL in the location bar, I go directly to my current newsletter at http://www.steveshank.com/cgi-bin/newsletter.pl. You can setup these shortcuts to anywhere you want. Here's how. First, bookmark the site. Each Bookmark has a spot for a keyword shortcut. Simply right click on the bookmark you'd like to shortcut and select properties. 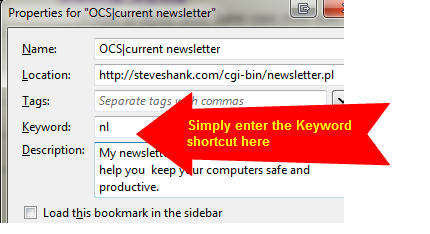 Then enter your shortcut or keyword. Now you can type that into the location bar and jump directly to the bookmarked page.